According to the tradition, an infusion of carqueja flowers cures all illnesses. The plant belongs to the flora of Portugal, Spain and Morocco, where it is known by several names. It is very common in mountains like Serra da Estrela and Serra do Açor, in Portugal, but its habitat extends for a very wide area of Europe and Africa. Carqueja is known for its many uses and abundance. Besides the medicinal use, carqueja used to be fed to cattle, mainly during winter because it endures low temperatures. The plant was also used as fuel for furnaces due to its high inflammability. Carqueja oils are used in aromatherapy. The flowers are edible, for example in salads. Rice with carqueja is a typical dish from Trás-os-Montes and Alto Douro, in the north of Portugal. Traditionally, carqueja is used to improve digestive functions, as a liver stimulant, as a diuretic and also in colds and flu. Usually, the whole plant is used, although the flowers are more popular, especially in infusions. It is also used for treating wounds in the form of poultice. The infused flowers are traditionally used as “tea for all ailments” and general discomfort. The list of therapeutic effects is a long one, but carqueja is rich in phenolic compounds like vanillic acid, caffeic acid, chlorogenic acid, syringic acid, p-coumaric acid, ferulic acid, ellagic acid and quercetin. It is good for fighting inflammation. Boiled carqueja roots can be applied to the skin in cases of acne. The infusion of the flowers is also used as a digestive, to soothe gastric pain and as an intestinal anti-inflammatory; due to its blood sugar lowering properties it can also help in type 2 diabetes. Carqueja promotes a good circulatory system, it is a vasodilator and a depurative. The plant is also recognized for treating the respiratory tract and the infusion of the flowers is used to alleviate flu, bronchitis, cough, sore throat, angina and sinusitis. Carqueja seems to benefit the nervous system as well and is used as a sedative and a general tonic, fighting physical fatigue and having stimulating effects. Once more, the power of plants against the effects of free radicals. Carqueja has a high level of antioxidants, which confirm its health benefits, especially working as an anti-diabetic, liver protector, anti-inflammatory, preventing and treating Alzheimer’s disease and showing anti-microbial effects. In spite of the mentioned effects, plants can be toxic if taken in high amounts. The idea that all that is natural is safe is wrong and people should be careful when using plants therapeutically. However, there is no information regarding the toxicity of this plant in small doses. The recommended usage is 3 cups of tea a day for short periods, not prolonging the treatment. 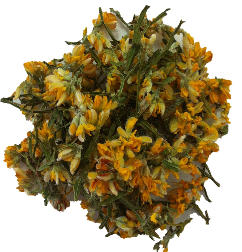 As mentioned, this plant lowers blood sugar and diabetics taking medication should ask their doctor for advice regarding the intake of gorse. Pregnant and nursing women should not drink carqueja tea. - Fernandes, Joana C. Determinação da atividade anti-inflamatória de extratos metanólicos de Pterospartum tridentatum. Universidade da Beira Interior, Ciências da Saúde, Covilhã, junho de 2012. - Filomena C. Neto , Mariana Tomé Falcato Simões. As Plantas Medicinais, Aromáticas e Condimentares da Sub – região do Alto Tâmega e Barroso. DRAP Norte - Ministério da Agricultura Desenvolvimento Rural e Pescas. - Martins, Joana Carmo. Erva Carqueja – Um chá para todos os males. Universidade Fernando Pessoa , Faculdade de Ciências da Saúde. Porto, 2012. - Neves, José Manuel; Matos, Carla M.;Moutinho, Carla G.;Gomes, Lígia Rebelo. Usos populares de plantas medicinais da flora transmontana. Edições Universidade Fernando Pessoa. Revista da Faculdade de Ciências da Saúde. Porto. ISSN 1646-0480. 5 (2008) 226-235.